Visit the Prizes page for national book awards won by this book. The first comprehensive biography of "the most forgotten major figure in American history,” reading this volume is nothing if not enriching. Michael’s narrative presents . . . a torrent of information in fine detail . . . a rich trove about a major historical figure. This must-read book will certainly become the "go to" source for researching John Hanson. An in-depth study of his life and friendship with George Washington, Remembering John Hanson is extremely well written, easy to follow and well documented. President John Hanson has long been forgotten as the man behind the struggles, and mover and shaker of our first government. Some of the best information on Hanson I have ever seen. This work represents the most comprehensive and—equally important—extensively documented exploration of the life and contributions of John Hanson. It provides the context and critical analysis to properly elevate Hanson to the pantheon of the fathers of our nation. You contribute greatly to our understanding of Hanson, his times and why he became largely forgotten. Remembering John Hanson is clearly and engagingly written with excellent illustrations. I have found your information to confirm my arguments why Hanson was the more significant first president of the United States. 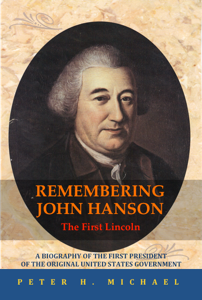 The story of John Hanson is much greater than previous authors have given credit to.